My hair has been a total nightmare since my kids were born. I swear I have less hair than I used to before I was a mom and what I do have left is limp, lifeless and thin. To make matters worse, I am obsessive about washing it every day, which only adds to its dry, flyaway charm. Not to mention the dry, windy climate in Kansas isn't particularly easy on the old follicles. I am always on the lookout for new haircare products as potential miracle workers, so I was excited when I was asked to review samples of WEN by Chaz Dean. WEN takes a drastically different approach to haircare by eliminating shampoo. No, you don't leave your hair dirty, but instead of stripping your delicate hair follicles with harsh lathering detergents and chemicals, it introduces a single product: WEN Cleansing Conditioner. I was skeptical and I have to admit that I initially missed the sudsing action but once I relaxed and let the gorgeous sweet almond mint scent wash over me, it felt good. And it did make my hair feel softer and fuller, especially after using it for about a week. I also loved the additional products included with home delivery of the WEN by Chaz Dean system. The wide tooth shower comb really works well to distribute the WEN Cleansing Conditioner and Re Moist Intensive Hair Repair Mask, which can be used in tandem. WEN Styling Creme is a non-sticky gel/lotion that can be used to hold styles and also to add polish after styling. The only item that wasn't such a great fit for me was the WEN Texture Balm, which is sort of a waxy pomade in stick form. I think would work better for people with shorter hair, especially men, or for more layered, piecey long hair styles. After a couple of weeks using WEN by Chaz Dean, my hair does indeed feel and look healthier. 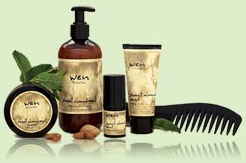 Order the WEN® Healthy Hair Care System 30-day supply in Sweet Almond Mint for only $29.95 plus $5.95 s&h. You'll receive your first 30-day supply with free bonuses, and you’ll automatically receive a new 90-day supply delivered to your home every three months, locked in at the discount price of just $29.95 a month plus $7.95 s&h per shipment. I did some online searching and it looks like there are other Wen by Chaz Dean Haircare fragrances available, too: Cucumber Aloe, Tea Tree, Lavender, and the one I'd like to try next, Fig! hhhmm... you get to try the coolest things. Sweet Almond Mint sounds yummy as do the other flavors. I'd have a hard time getting used to no suds but I guess what works, works.